MANILA, Philippines – Gilas Pilipinas might have swept Group B in the elimination rounds with an immaculate 3-0 record. But tonight, Team Philippines suffered its very first loss at the knockout quarterfinals against the much quicker and much taller South Koreans, 118-86, on August 17 in Beirut, Lebanon. It’s been 3 years since Philippines beat South Korea and broke the “Korean Curse.” But, that win during the FIBA Asia Championship in Manila is Philippines’ lone victory against SOKOR in 10 face offs prior to this game. Not a good start for Philippines as Korea scored first in less than 10 seconds right after the opening tipoff followed by a three pointer and a turnover by Gilas Pilipinas. Jayson Castro-William on the other end of the floor, showed the Koreans why he’s being called as “The Blur” by relentlessly attacking the basket and leaving his guards behind. Christian Standhardinger who took an off during the game against Qatar due to severe stiffed neck came back aggressively in this game. The Fil-German made a living under the basket and helped Philippines to take the lead with 3 minutes remaining in the first. June Mar Fajardo made his first ever appearance in this tournament at the 2-minute mark of the first. Fajardo however missed his first couple of shots and Philippines found itself behind South Korea by 8 points, 26-18. Team Pilipinas welcomed 2nd quarter with another turnover and a foul against Standhardinger. But Terrence Romeo was too quick to atone his team’s lapses with a back-to-back triples. The Koreans however, countered every Gilas basket and maintained their lead. Romeo made 11 straight points from the moment he stepped on the court. But, the Koreans sizzled hot from the outside and escalated the lead to a dozen, 41-29 with 6:21 remaining in the half. South Korea led as much as 16 points before the first half expired. Terrence Romeo’s 22 2nd period points including 7 three pointers trimmed the margin to just 8, 49-57. South Korea started the 2nd half with quick 7 points that brought its double-digit margin back. Along with this, the Koreans began to trap and double-team Terrence Romeo. 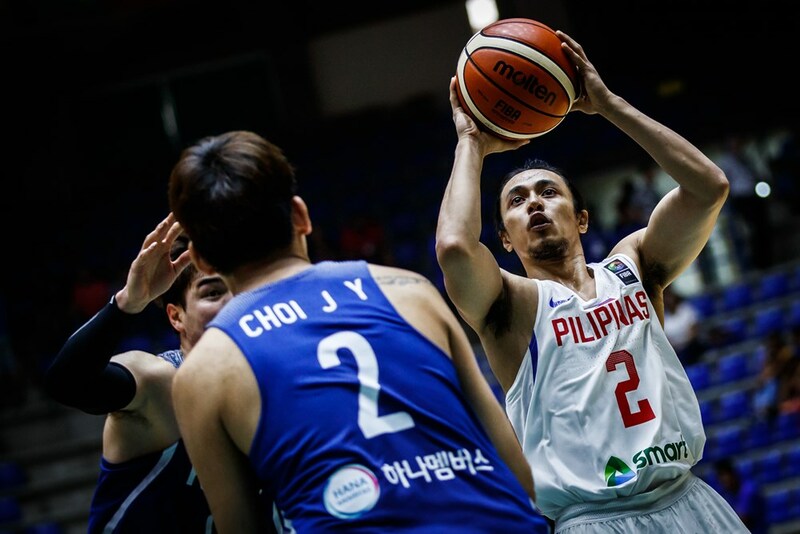 Gilas’ defense collapsed in the 3rd quarter combined with total bad luck as the Filipinos’ kept on missing their shots that resulted to a 22-point humongous lead for South Korea. Coach Chot Reyes shuffled his men several times and hoped to get the right combination in both offensive and defensive departments. After 3 quarters, Reyes still unable to field in the perfect Gilas five and trailed the Koreans, 86-62. Gilas Pilipinas opened its 4th quarter campaign down by big numbers. All of its players had gone cold and unable to make baskets even the easy ones. Terrence Romeo was completely shut down after erupting for 22 points while Matthew Wright who was playing excellent basketball in the previous games was totally missing in action in tonight’s game. South Korea hit the century mark, 102-73 with 3:55 remaining in the ballgame and Philippines’ hope in bouncing back vanished. Despite the big lead, South Korea still drained triples to keep its distance from Philippines. Coach Chot Reyes waived the white flag as he pulled out his top scorers and combo-guards Terrence Romeo and Jayson Castro-William. As the final horn sounded, Gilas Pilipinas exits the tournament after getting a serious beating from South Korea, 118-86. South Korea advances to the knockout semis and awaits the winner of Iran vs. Lebanon game. The Summit Express congratulates Gilas Pilipinas for representing our country’s colors in this tournament. The Filipinos are still proud of you! Laban Pilipinas! Puso!